AANTEX Pest Control has a full service termite department. We have licensed and experienced inspectors who initially inspect the home or commercial building to look for any Wood Destroying Organisms or conducive conditions in your structure. The inspector will review their findings with the property owner and will provide a detailed report with Findings and Recommendations. Recommendations may include treatments for various wood destroying organisms, repairs to damaged wood members, installation of devices to reduce conducive conditions, or referrals to other trades for specialized services. Termite colonies eat non-stop—24 hours a day, seven days a week. Termites cause up to $2 billion of damages per year! Subterranean Termites are the most destructive kind of termite. 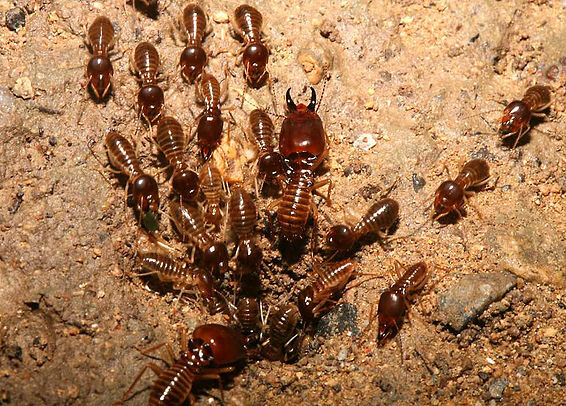 They have colonies that have up to 2 million termites. Subterranean Termites need contact with the soil to survive. They live in underground colonies or in wet areas aboveground. They eat a lot of wood and they can cause some very expensive damage to a house! They can destroy building foundations, wooden support beams, plastic plumbing pipes, sub-flooring, insulation … even swimming pool liners and filtration systems! Termites can also injure or destroy living trees and shrubs. Drywood termites can build nests and dig tunnels in buildings. Drywood termites form colonies of 2,500. These tunnels cause major damage because the wooden support beams can become weak and make the building lean or fall down. Drywood Termite colonies are usually found in dry wood and they do not require moisture or contact with the soil. Aantex is fully licensed and trained to provide the consistent quality Termite Services, that your home or commercial property may require. With over 35 years of trusted experience treating thousands of properties, Aantex can tailor a program that fits your needs at a price you can afford. Using specially formulated EPA approved materials, your technician will care for your home and protect your most valuable asset.